Callie Anson should have learned her lesson by now: revisiting the past is seldom a good idea. But she succumbs to peer pressure and attends a reunion at her theological college in Cambridge, where she is forced to confront painful memories - and the presence of her clueless ex, Adam. 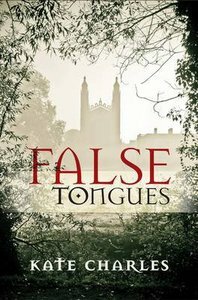 Margaret Phillips, the Principal of the college, has a chance for happiness but before she can grasp it she has to deal with her own ghosts - as well as corrosive, intrusive gossip. Both women learn something about themselves, and about forgiveness, from the wise John Kingsley. Meanwhile, in London, police officers Neville Stewart and Mark Lombardi are involved with the latest fatal stabbing of a teenager. Was gifted, popular Sebastian Frost all he seemed to be, or was there something in his life that led inevitably to his death? They're plunged into the queasy world of cyber-bullying, where nothing may be as it seems. While they're apart, Callie and Mark's relationship is on hold, and his Italian family continues to be an issue. Will Marco realise, before it's too late, that while his family will always be important to him, he is entitled to something for himself?